Protestants were grouped into religious traditions based on the specific denomination with which they identify. For instance, all members of the Southern Baptist Convention have been classified as members of the evangelical Protestant tradition, those who belong to the American Baptist Churches USA are classified as members of the mainline Protestant tradition and those who belong to the National Baptist Convention are classified as members of the historically black Protestant tradition. Protestant respondents who gave a vague answer to denominational questions (e.g., “I am just a Baptist” or “I know I am Methodist but don’t know which specific Methodist denomination I belong to”) were placed into one of the three Protestant traditions based on their race and/or their response to a question that asked if they would describe themselves as a “born-again or evangelical Christian.” This means that some groups may appear within more than one tradition. For example, independent Baptists appear in both the evangelical Protestant tradition and the historically black Protestant tradition, and a respondent’s placement into one or the other depends on the race of the respondent. These cases are noted in the detailed summary at the end of this appendix. Overall, 38% of Protestants (including 36% of evangelical Protestants, 35% of mainline Protestants and 53% of those in the historically black Protestant tradition) gave a vague denominational identity, necessitating the use of their race or their born-again status (or sometimes both) to categorize them into one of the three major Protestant traditions. 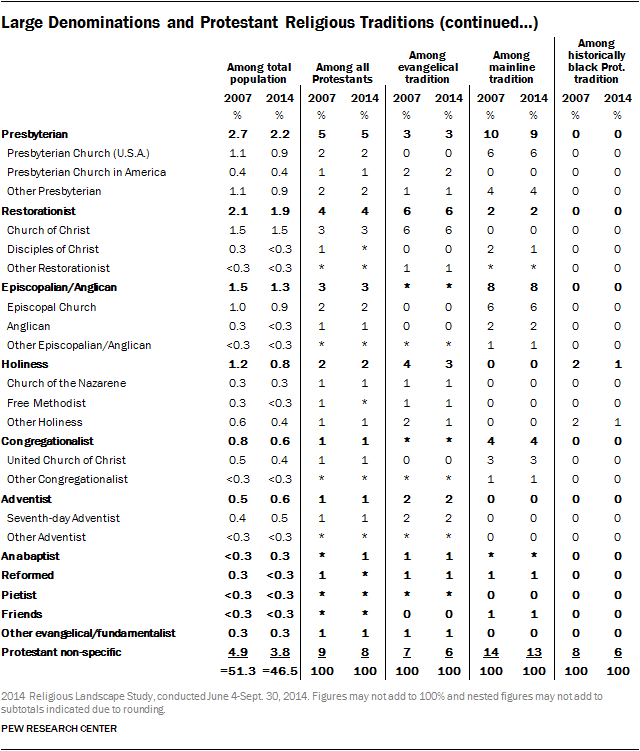 The table below estimates the size of the largest Protestant denominations and identifies the Protestant tradition to which each belongs. Note that many denominational families include denominations that are associated with more than one Protestant tradition. For example, Baptists are found within all three Protestant traditions, Pentecostals belong to either the evangelical or historically black Protestant tradition and Lutherans belong to either the evangelical or mainline tradition. 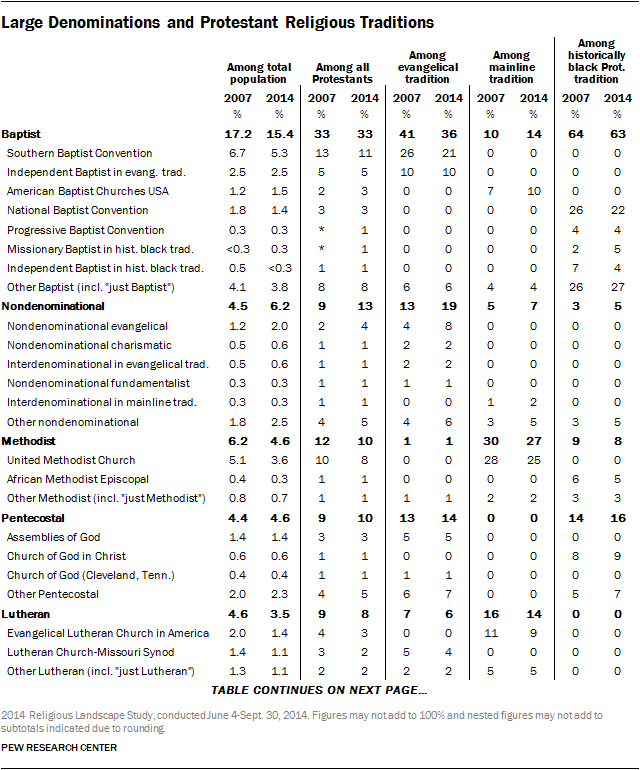 The denominations listed below represent answers given by survey respondents. Some denominations were offered to respondents as explicit answer categories during the interview, while others were volunteered by respondents. Respondents who gave vague denominational affiliations were assigned to a religious tradition based on their race and/or their response to a question that asked whether they would describe themselves as a “born-again or evangelical Christian,” as noted in italics. “Born again,” “Bible believers,” etc.